President Barack Obama has joined 9/11 survivors and rescuers at the memorial museum dedication ceremony on the site of the attacks in New York. Barack Obama told those gathered it was a “sacred place of healing and of hope”. 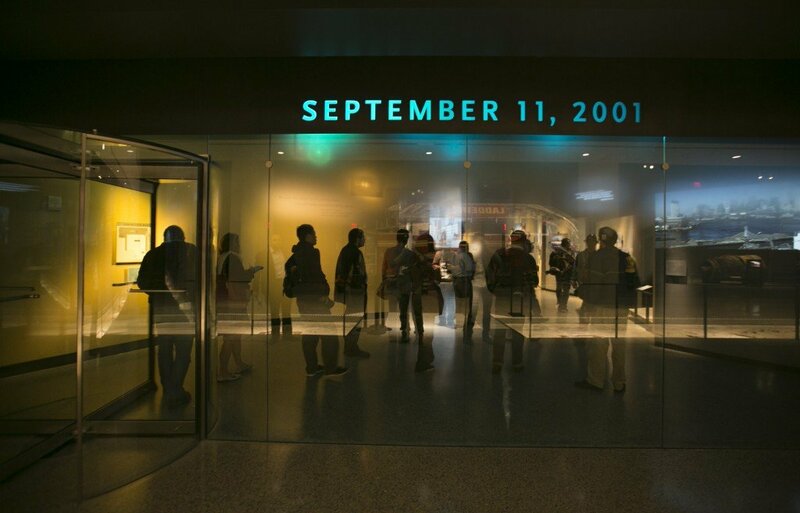 The National September 11 Memorial Museum includes thousands of personal items and parts of the World Trade Center towers themselves. Almost 3,000 people died on 11 September 2001 after al-Qaeda hijackers flew planes into the towers. Another hijacked plane hit the Pentagon. A fourth crashed into a field in Pennsylvania after passengers fought with the hijackers. President Barack Obama and first lady Michelle Obama toured the museum, viewing a memorial wall with photos of victims and a mangled fire truck, before the ceremony began at 10:00 EST. Former New York Mayor Michael Bloomberg, former President Bill Clinton and former Secretary of State Hillary Rodham Clinton joined them. In his opening remarks at the ceremony, Michael Bloomberg said the museum was “a reminder to us and all future generations that freedom carries heavy responsibilities”. Barack Obama said the museum means we can all “look into the faces of nearly 3,000 innocent souls”. “We can touch their names and hear their voices, glimpse the small items that speak to the beauty of their lives – the wedding rings, a duty helmet, a shining badge,” he told those gathered. As well as rescuers, survivors and relatives of people who lost their lives, there was in attendance the New York mayor at the time of the attacks, Rudy Giuliani, the present mayor, Bill de Blasio and actor Robert De Niro. Along with the nearby memorial plaza, the New York city museum cost $700 million in donations and public money. The museum, not far from the original site of the World Trade Center, is largely underground. The museum will be fully open to the public on May 21. The museum features dramatic and horrific moments of the day in videos, including the two skyscrapers collapsing, but also symbols of heroism, such as damaged fire trucks and the wristwatch of one of the passengers who confronted the hijackers. “You won’t walk out of this museum without a feeling that you understand humanity in a deeper way,” said museum President Joe Daniels. Charles Wolf, who lost his wife Katherine in the attacks, said he was awaiting the ceremonial opening on Thursday with a mix of anticipation and dread. “It brings everything up,” he said. The museum is not without controversy. Some relatives of victims are upset that unidentified humans remains found in the rubble will be located near the museum at Ground Zero. Some Muslim groups have also said a video describing al-Qaeda and the run-up to the attacks does not differentiate enough between the violent hijackers motivated by a radical vision of Islam and regular Muslims.